Kendrick Lamar's Damn has been crowned music critics' favourite record of 2017. Damn, released in April, roundly beat some of the best-selling albums of 2017, such as Ed Sheeran's Ã· (Divide), Taylor Swift's Reputation and Drake's More Life project, thanks to its combination of self-examination, politics, and treatise on American society. Female artists did well in the poll, with second place going to Grammy-nominated artists SZA, for her partially-improvised R&B album CTRL, and Lorde, who came third with her sophomore effort, Melodrama. 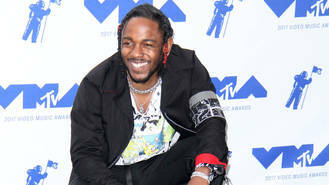 Kendrick's album topped a "poll of polls" compiled by BBC News from 30 "album of the year" shortlists, published by the most influential magazines, newspapers and blogs in music - from specialist magazines like Billboard and NME to more mainstream outlets, such as Cosmopolitan and PopSugar. Records were assigned points based on their position in each list - with the number one album getting 20 points, the number two album receiving 19 points, and so on. Sheeran's album only received one point, for a mention from People magazine, who put it in seventh place on their year-end list. But the Compton-born rapper emerged the clear winner after he took first place on 10 of the polls surveyed by the BBC, with his album garnering 28 poll mentions. Critics gushed over the 30-year-old's fourth studio album, with Q magazine dubbing it "a flawless hip-hop masterclass" and Billboard magazine stating: "It is the unimpeachable truth that Kendrick Lamar recorded the greatest album of 2017." The poll contained a diverse range of artists including Kelela, Khalid, Charli XCX, Kesha and Tyler, the Creator. Even excluding non-U.K. publications from the BBC's survey, Kendrick still held the top spot, but U.K. rappers J Hus, Stormzy and Loyle Carner moved higher up the rankings. Love Zombies felt "honoured" to record their debut LP at the same studio Chris Cornell recorded his solo stuff. Azealia Banks 'incredibly flattered' to be collaborating with her former rival Iggy Azalea. Katy Perry has outraged Australian animal lovers by telling her dog to chase koala bears in an advert for a department store. Marcus Mumford, Ella Eyre and Lianne La Havas have joined the judging panel for the 2017 Hyundai Mercury Prize. Matt Bellamy thought he was abducted by aliens once while high on a substance grown in his hometown of Devon. Ed Sheeran's 'Shape of You' has overtaken Drake's 'One Dance' as the most streamed song in the UK. Ed Sheeran wants to tell his story in a film modelled on Eminem's semi-fictional biopic 8 Mile. Fifth Harmony received a standing ovation from TV’s Mr Nasty Simon Cowell when he heard their new music. James Bay has launched his very own 1966 Epiphone Century guitar. Fifth Harmony are fully focused on maintaining their friendship following the departure of Camila Cabello. Ed Sheeran has turned off Twitter after becoming the target of vicious comments. Madonna's manager, Israeli-born Guy Oseary, has defended JAY-Z from accusations his lyrics are anti-Semitic. Justin Timberlake and Pharrell Williams are in the early stages of their mystery musical collaboration. Paul McCartney stopped drinking alcohol pre-performance as it caused him to forget the words to his hits on stage. Clean Bandit and Jax Jones complete the line-up for MTV Crashes Plymouth. Kanye West is reportedly teaming up with Justin Bieber for his big comeback album. Beyonce signed off on every song on her rapper husband JAY-Z's confessional new album. Katy Perry has jokingly branded Niall Horan a "stage 5 clinger" after crossing paths backstage at The Voice Australia. Shaun Ryder says cycling got him off drugs. Anne-Marie's tattoos are the story of her life. Beyoncé approved every song on Jay-Z's '4:44'. Fyre Festival founder Billy McFarland has been arrested and released on bail. Liam Payne wants to try his luck at Vegas casinos after an amazing run in his personal life. Mel B was accused of squandering her Spice Girls fortune during a hearing held as part of her divorce case on Friday (30Jun17). Phil Collins returned to performing live as he missed his fans too much. Chance the Rapper is donating one of his three Grammy Awards to museum officials in his native Chicago, Illinois. Beyonce and JAY-Z have reportedly filed legal documents in a bid to trademark their new twins' names.